Bitcoin and the concept of its blockchain were first introduced in the fall of 2008 as a whitepaper and later released as open-source software in 2009. The author who first introduced Bitcoin in that 2008 whitepaper is an anonymous programmer or cohort working under the name of Satoshi Nakamoto. Nakamoto collaborated with many other open-source developers on Bitcoin until 2010. This individual or group has since stopped its involvement in the project and transferred control to prominent Bitcoin core developers. There have been many claims and theories concerning the identity of Nakamoto, but none of them have been confirmed as of this writing. Regardless, what Nakamoto created is an extraordinary peer-to-peer payment system that enables users to send Bitcoin, the value transfer token, directly and without an intermediary to hold the two parties accountable. The network itself acts as the intermediary by verifying the transactions and assuring that no one tries to cheat the system by spending Bitcoins twice. Nakamoto’s goal was to close the large hole in digital trust, and the concept of the blockchain was his answer. It solves the Byzantine general’s problem, which is the ultimate human problem, especially online: How do you trust the information you are given and the people who are giving you that information, when self-interest, malicious third parties, and the like can deceive you? Many Bitcoin enthusiasts feel that blockchain technology is the missing piece that will allow societies to operate entirely online because it reframes trust by recording relevant information in a public space that cannot be removed and can always be referenced making deception more difficult. Blockchains mix many old technologies that society has been using for thousands of years in new ways. For example, cryptography and payment are merged to create cryptocurrency. Cryptography is the art of secure communication under the eye of third parties. Payment through a token that represents values is also something humans have been doing for a very long time, but when merged, it creates cryptocurrencies and becomes something entirely new. Cryptocurrency lets you take the concept of money and move it online with the ability to trade value securely through a token. Blockchains also incorporate hashing (transforming data of any size into short, fixed-length values). 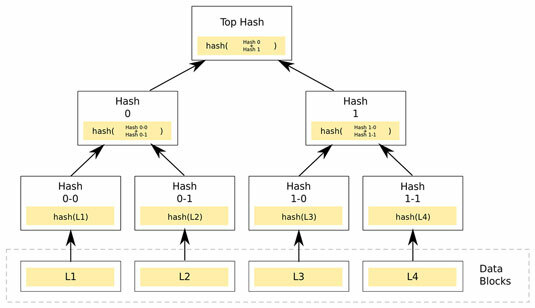 Hashing also incorporates another old technology called Merkle trees, which take many hashes and squeeze them down to one hash, while still being able to prove each piece of data that was individually hashed. Ultimately, blockchains are ledgers, which society has been using for thousands of years to keep financial accounts. When all these old models are merged and facilitated online in a distributed database, they become revolutionary. Bitcoin was designed primarily to send the Bitcoin cryptocurrency. But very quickly, the creators realized that it had a much larger potential. With that in mind, they architected the blockchain of Bitcoin to be able to record more than the data concerning the movement of the token. The Bitcoin blockchain is the oldest, and one of the largest, blockchains in the world. It’s composed of thousands of nodes that are running the Bitcoin protocol. The protocol is creating and securing the blockchain. In very simple terms, the blockchain is a public ledger of all transactions in the Bitcoin network, and the nodes are computers that are recording entries into that ledger. The Bitcoin protocol is the rules that govern this system. Nodes safeguard the network by mining for the cryptocurrency Bitcoin. New Bitcoins are created as a reward for processing transactions and recording them inside the blockchain. Nodes also earn a small fee for confirming transactions. Anyone can run the Bitcoin protocol and mine the token. It’s an open-source project that thrives as more individuals participate in the network. The fewer people who participate, the more centralized it becomes — and centralization weakens the system. The primary thing that makes Bitcoin a secure system is the large number of independent nodes that are globally distributed. The most successful miners have robust systems that can outperform slower miners. Early in its history, you could run the Bitcoin protocol and earn Bitcoins on a desktop computer. Now, in order to have any hope of ever receiving Bitcoins, you need to purchase expensive specialized equipment or use a cloud service. In order to create a message in the Bitcoin blockchain, you have to send some Bitcoin from one account to another. When you send a transaction in Bitcoin, the message is broadcast across the whole network. After the message is sent, it’s impossible to alter it because the message is recorded inside the Bitcoin blockchain. This feature makes it imperative that you always choose your message wisely and never broadcast sensitive information. Broadcasting the same message to thousands of nodes and then saving it forever in the token’s ledger can add up in a hurry. So, Bitcoin requires that you keep your communications very short. The current limit is just 40 characters. Bitcoin is a living and ever-changing system. The Bitcoin core development community is actively seeking ways to improve the system by making it stronger and faster. Anyone can contribute to the Bitcoin protocol by engaging on its GitHub page. However, there is a small community of dominant core developers of Bitcoin. The most prolific contributors are Wladimir Van Der Laan, Pieter Wuille, and Gavin Andresen.